I once said that the hardest reviews to write are of the books you love the most. But I was wrong--the hardest reviews to write are of the books that feel the most important. 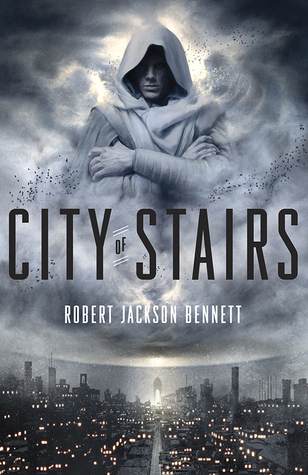 And Robert Jackson Bennett's genre-busting novel City of Stairs is a must-read for anyone who cares about fantasy fiction. Why? Because fantasy is, far more than its cousin science fiction, slave to its conventions; few works genuinely challenge those conventions as dramatically or effectively as City of Stairs. And for that alone, you should read this novel. But it also happens to be a really good story. City of Stairs takes place in the city of Bulikov, which was once the capital of "the Continent," a large landmass made up of multiple, vaguely Slavic societies, who at one point united to conquer the known world. They were able to do so because the gods (or "Divinities") favored them and empowered them with powerful, reality-bending magics. Until, that is, the day when a leader--called the Kaj--rose from the subjegated, vaguely South Asian Saypuri. With a terrible (and largely unexplained weapon), the Kaj and his army killed the Divinities, which instantly destroyed everything that depended upon their magic (include the actual buildings people lived and worked in). Vast destruction followed. Now the Saypuri have subjugated the Continent, maintaining Their hegemony through technological superiority and the banning of both magical artifacts and open discussion of the Continent's magical past. City of Stairs covers the basics of genre storytelling effectively. The plot is fast-paced and engrossing, the characters deep and well-rounded and there's a good mix of investigation, action and contemplation. The narrative structure is complex but not gimmicky, with Bennett weaving Shara's and Sigrud's backstories, as well as the political history of Continent and Saypur, into the foregrounded mystery without infodumping (i.e. the bane of my literary existence). And genre readers will delight in Sigrud, who may be a millennia-old trope, but somehow manages to feel fresh and exciting. The scene where he fights the sea monster is just...wow. Simply put, City of Stairs is on one level a fun book that can appeal to a broad cross-section of fantasy readers. But it's much, much more than that. Fantasy is, like the romance novel or police procedural, a fundamentally conventional genre, with all its attendant sub-genres defined by laundry-lists of expected ways of doing things. And if something unconventional comes around, given that it's sufficiently popular, it simply spawns a new convention. So it's unexpected and delightful to read a novel that simply refuses to be categorized: it's epic but not medieval, so it's not epic fantasy; there are cars but no guns, so it's not flintlock fantasy; there are dirigibles but no Victorianisms, so it's not steampunk; it takes place in one city but in a second world, so it's not urban fantasy; etc. Instead it's a world where magic and technology coexist, where technologies from various historical time-periods coexist, where architecture is central to the story being told and where no place or people is based off of English or Anglophone archetypes. A: Why is fantasy so damned conventional/risk-averse? A: "If there are dragons and/or wizards, 'realism' is already out the window." B: "Yes, but if everything is unrealistic, readers won't have anything to hold on to." A: "That's what I call 'a lack of imagination.'" Now, I read (and enjoy) a lot of conventional fantasy, but eh...I find the lack of boundary-pushing more than a little frustrating. Still, the argument that messages or agenda can overshadow fundamentals has some merit, in the sense that they shouldn't but they can. So it's notable that City of Stairs breaks fundamentally with convention in ways that never feel less than wholly intuitive, fully realized and deeply integrated into the DNA of the novel. Everything is internalized into character perspective, nothing is infodumped and the result is a rich, vibrant and incredibly exciting fantasy world like no other I've ever encountered. City of Stairs is also a fundamentally political novel, but one that eschews clear metaphor for more ambiguous explorations. Some reviewers (for example Nisi Shawl) have situated City of Stairs within postcolonial discourses, in the sense that it presents a world at least partially defined by historical oppression of dark-skinned peoples (the Saypuri) by light-skinned peoples (the Continentals). But II don't think that's quite what Bennett is getting it. Though the historical oppression of Saypur is quite disturbing, Saypur is now the colonial overlord, and book takes place in what is in essence a captive city. Indeed, over time Shara grows more and more troubled by the colonial regime she represents--even as she works to stop those who would seek to restore the old order. The effect is to argue that oppression is simply what power differentials lead to, and to argue that such behavior is unacceptable regardless of whether it is justified in terms of "divine right," historical grievance or material "superiority." Yet this also leads the reader to focus on Bennett's cultural choices. The Continentals are pseuso-Slavic, the Saypuris pseudo-South Asian--but why? It's refreshing to read a fantasy novel where the default categories are neither pseudo-Anglophone nor pseudo-Celtic, but where the subjects are not exoticized either. At the same time, considering how little these cultural choices mattered, I was never clear why anyone needed a pseudo-Slavic or pseudo-Sanskrit name to begin with--or, for that matter, a pseudo-Angophone or pseudo-Celtic one. (Sigrud is a different story, of course, but the Dreylings are the cultural group with with the least impact on the narrative.) The effect isn't bad, per se; rather, it just feels underdeveloped. Finally, the one negative--the ending. I won't spoil it, and I'll note that it isn't all bad, but it nevertheless felt a bit too network TV for a novel that was HBO-plus 95% of the way to the finish line. Regardless, City of Stairs is a dazzling, sophisticated and thoroughly modern fantasy, and stands in contrast to the staid medievalisms that dominate the genre. Imagine China Mieville and George R. R. Martin stuck in an elevator, with only a laptop to keep them company, and you’re almost there. It is a monumental work of fantasy that does more to push the genre forward than anything I've read in years, and will likely go down as the best fantasy novel of 2014. Robert Jackson Bennett is a name to remember and a talent to behold. Bonuses: +1 for best world-building ever; +1 for smartly ambiguous political allegory; +1 for Sigrud! Penalties: -1 for unclear reasons for cultural choices; -1 for ending disappointment. Nerd Coefficient: 10/10. "A true game-changer."